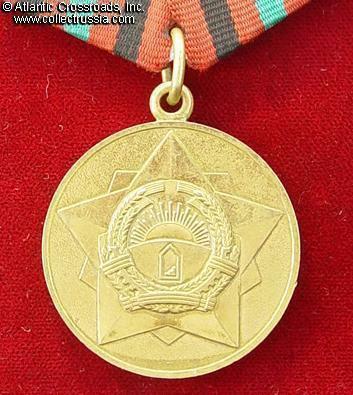 Medal for Service in the Armed Forces, 1st class (for 20 Years of Service), 1987-1992. Medal for Service in the Armed Forces, 1st class (for 20 Years of Service), 1987-1992. In gilded brass. 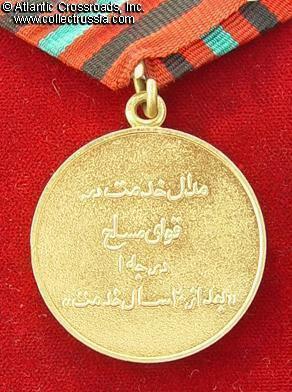 Inscribed in Dari "Medal of Service in the Armed Forces, After 20 Years". The number of years in service that this medal signifies has been subject of much controversy and confusion among the collectors. Excellent condition with light wear only. Comes with original suspension and generic red-black-and-green ribbon, as this medal was almost invariably worn by its recipients. The ribbon is used but in excellent condition.